(Washington – Washington Post) - As many as 250,000 veterans of the first Gulf War "have persistent unexplained medical symptoms" whose cause may never be found, although genetic testing and functional brain imaging may eventually shed some light on the problem. That is one of the conclusions of a new review of research on the constellation of physical complaints originally known as "Gulf War syndrome" experienced by many soldiers soon after the United States drove invading Iraqi forces out of Kuwait in early 1991. 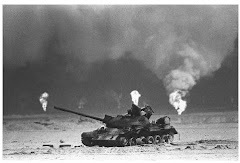 The review, by the National Academy of Science's Institute of Medicine, found that the only illness clearly caused by the Gulf War is post-traumatic stress disorder (PTSD). It is present in 2 to 15 percent of Gulf War veterans (depending on how it is diagnosed), and about three-times more common in them than in soldiers who served at the same time but were deployed elsewhere. 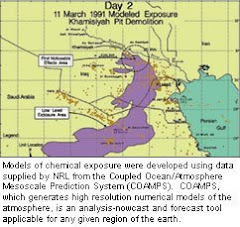 The 12-member panel of medical experts also found "evidence of an association" between Gulf War service and anxiety disorder, alcohol abuse, dyspepsia, irritable bowl syndrome, and "multisymptom illness" (its term for Gulf War syndrome) although not clearly a causal one. Among the features of "multisymptom illness" are fatigue, muscle and joint pain, poor sleep, moodiness, lack of concentration, and in some people, skin rash and diarrhea. A survey of 10,000 veterans conducted in 2005 found that 37 percent of those who were in the Gulf had the illness, compared to 12 percent deployed elsewhere. An increase in vague symptoms and persistent pain has also been seen in some non-American groups, including British troops who served in the Gulf, and Danish peacekeepers who were there after the war. "We concluded that these symptoms are highly prevalent, persistent, and apparently disabling in this veteran population, even two decades after the war," said Stephen L. Hauser, the panel chairman and a professor of neurology at the University of California at San Francisco. "They defy efforts, thus far, to fully understand their cause." The 289-page report released Friday was generally praised by advocates for more attention to Gulf War veterans, and those who believe there is a cause to be found for Gulf War syndrome. Paul Sullivan, director of Veterans for Common Sense, in Washington, said his organization will now ask Secretary of Veterans Affairs Eric K. Shinseki to propose regulations that will provide disability benefits and free medical care to all veterans suffering from "multisymptom illness." "This is a huge victory for Gulf War veterans," said Sullivan, a 47-year-old former Army scout who said he has been ill since his Gulf service. Two years ago, the VA-appointed Research Advisory Committee on Gulf War Veterans' Illnesses issued a report saying that toxic exposures were probably the cause of Gulf War illness. Its chairman, James Binns, asserted Friday that the two reports "agree on the most important things -- that the multisymptom illness that affects so many Gulf War veterans is a terrible, distinct illness, and that this nation can and should launch a Manhattan Project-style research program to identify treatments and prevent this from happening again." The Institute of Medicine panel, whose members are academic physicians and epidemiologists, reviewed 1,000 studies, focusing particular attention on 400 completed since the institute's last review of Gulf War illnesses in 2006. Many veterans think exposure to pesticides, medicines and environmental toxins damaged soldiers' brain and immune systems, causing chronic illness. The panel called for "genome-wide association studies," which scan large numbers of people looking for gene variations shared by sufferers of a single disease. It also said that sensitive brain imaging and tests for overstimulation of the immune system are promising tools for future research.